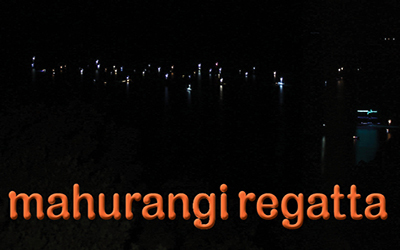 For many, the Mahurangi Regatta beats Christmas. But not every devotee can attend every regatta prize giving and dance, all of the time it runs. Until tonight. Thanks to the wonderful people who did the Warkworth Town Hall proud doing Mahurangi Action the deal of the century—Corporate AV Services—and to others, tonight’s Mahurangi Regatta prize giving and dance will livestream, for the first time. In 2004, when Mahurangi Action was known as Friends of the Mahurangi, the West City Jazz Orchestra was the Prohibition Big Band. Prohibition by name but far from prohibitive in cost, which meant that that which was planned as a one-off—much like the 1977 regatta that proved to be the revival of the regatta as an ongoing annual event—was financially survivable, if only barely. Also at the first gig, and every prize-giving dance since, was soundman Rob Campbell. And it was he who recommended Corporate AV Services to the Warkworth Town Hall job. This, combined with the generosity of ex-Mahurangi West, and now Oaks-on-Neville resident, J Barry Ferguson, and a timely steer towards the Lottery Auckland Community, saw the beautifully restored building equipped with great-sounding and looking, installed audiovisual equipment, at half the price less-focussed suppliers had suggested. The Mahurangi has good friends indeed. And from about 5.30 pm onward, go to Mahurangi Action’s Facebook page.